Want the best date squares recipe? Get ready to be over the moon! You've just found the best one ever — it may be the only one you will ever need! Grandma and Mom often made date squares for special occasions, and now you can make the same delicious, rich-tasting treats. You'll find them unsurpassed. Grandma happened to find this old fashioned recipe for date squares in an old copy of the Ontario Farmer magazine, and Mom often used it to make her scrumptious squares. They are tasty, moist, crumbly with rolled oats, and absolutely delicious! 3/4 cup butter, 1 cup brown sugar, 1 teaspoon baking soda dissolved in 2 tablespoons hot water, 1-3/4 cups rolled oats, 1-1/2 cups flour, 1/2 teaspoon salt. Cream butter, add sugar, flour, rolled oats, salt and soda. Divide mixture in two and spread half of it on the bottom of the baking pan. Place the date filling, given below, on top of this and spread the remaining half of the mixture on the filling. Bake in a moderate oven for 30 minutes. Cut when cool. Make the filling by mixing together 1/2 pound dates, 1 cup water, 1/2 cup brown sugar. Cook until thick; cool before spreading. The filling should be prepared before beginning mixing the other ingredients. Mom obtained most of the following date cookie recipes from Grandma, and the rest she clipped from Canadian magazines and newspapers in the early 1920s. 2 egg whites, 1/2 cup granulated or fruit sugar, 2 cups cornflakes, 1/2 cup chopped dates, 1/2 cup chopped nuts, 1/2 teaspoon vanilla. Beat egg whites stiff, add sugar gradually. Mix in other ingredients, drop by spoonfuls on a buttered baking sheet and bake in a moderate oven. Beat 3 eggs well. Add 1 cup sugar, 1 teaspoon vanilla, 1 cup walnuts broken in pieces, 1 cup dates. Then beat in 1-1/2 cups flour, 2 level teaspoons baking powder and a pinch of salt. Have dough 1/2 inch deep. Bake in moderately hot oven. Cut into bars while warm and shake in a bag of confectionery sugar. 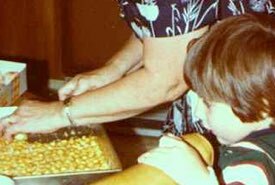 Mom always made her date squares extra thick and cut them in generous-sized pieces, almost coaster-sized. Well, I might be exaggerating a wee bit, but not much — her squares were big! And so rich and good tasting too! I loved them, and I know you will too. 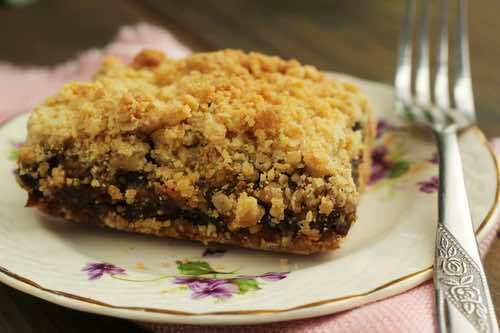 I've also included some vintage date cookie recipes that make what I call "almost" date squares. Use them to make a variety of delicious homemade treats with the rich, exotic flavor of dates. They are perfect for serving at your next party or on any occasion. You'll enjoy these yummy desserts.